The hovercraft is two things at once. A plane that skims over land on a cushion of air. And a boat tough enough to plough through hell and high-water. Much like the SLOOP, our Deck Shoe in Sand Brown Nubuck. It’s styled like a luxury slip-on loafer – and is just as comfortable – but it’s built like a sturdy deck shoe. Like many sailors, it goes both ways. And in a SLOOP, so could you.It wears like a deck shoe but it fits like a loafer! 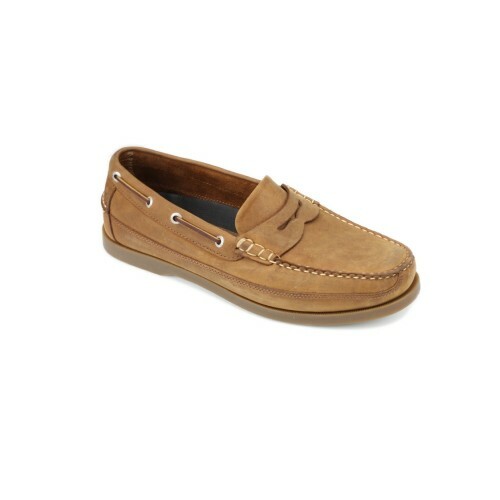 Enjoy the best of both worlds with the Sloop Mens Slip-on Boat Shoe in Sand Nubuck.